Enable HQ WebGL graphics in Firefox 4 Beta - OMG! Ubuntu! Of the many new features Mozilla are stuffing the next edition of their premier browser with is support for the ‘work in progress’ HTML 3D graphics API WebGL. This will provide high-quality 3D graphics in-browser without the need for plugins. OMG!’s good friend Bilal “bug crusher” Akhtar sent over some instructions for getting it up and running in Ubuntu Lucid which i’ve printed below. You will need to be running the latest Firefox 4 Beta – instructions for nabbing that can be found here. Install package libosmesa6 from the ubuntu repos. Open about:config in ff 4 and enter webgl in the filter box. Now you’ve enabled it you’ll want to see it in action, right? Head over too3d.googlecode.com/svn/trunk/samples_webgl/o3d-webgl-samples/pool.html. 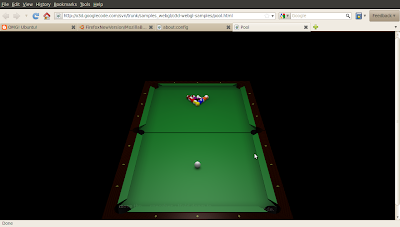 If you see a pool table are per the screenshot below then congratulations – you now have WebGL enabled in Firefox.